The two camouflaged motorcycles approached the intersection from the east in a bowl of dust, and the soldier in front raised his hand to signal a stop before skidding to a halt. The second biker pulled up next to him, and they carefully observed their surroundings before they cut the engines. They sat motionless for a few moments, and listened for any sounds from the dense vegetation and trees around them. The first rider pointed to the intersection and identified the four spots where the disturbances in the road indicated the presence of landmines. He took his binoculars from the bag strapped to his chest, and scanned the area before he zoomed in on the identified spots. The mines were strategically planted in the middle of the intersection, and he noticed a wire connecting the four mines, lightly covered with gravel. He knew they were booby-trapped and if one were triggered, all four would explode in a split second. They felt the vibration before they heard the sound of the vehicle approaching at a very high speed. Charlie looked up from the map he was balancing on the handlebars of his bike. Keith lowered the binoculars and turned to Charlie with a frown. “What are they doing on the road? We have not cleared it yet?” Keith said as he got off his bike and reached for his rifle strapped to his back. He turned his head sideways to identify the direction of the sound and approaching vehicle. 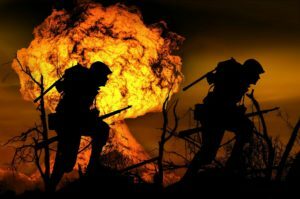 They both looked up and saw the dust rising above the trees to the south of the intersection as the sound became louder. They realized the danger at the same time and as Charlie grabbed his rifle from his back, he shouted to Keith. They scrambled in opposite directions to the side of the road, slid underneath foliage to take cover, and rolled over to face the intersection. The black Mercedes Benz entered the intersection at high speed and detonated the first landmine with the left front wheel. The explosion of the first mine hit the rear end of the car, and the chain of explosions propelled the car forward in pieces of junk and parts that flew in all directions. The second mine struck directly under the engine which became airborne and landed a few hundred yards away from the rest of the car. It all happened in super slow motion. The town lay still in the Indian summer sun. On Elm Street, the main thoroughfare, nothing moved. The shopkeepers, who had rolled protective canvas awnings down over their front windows, took the lack of trade philosophically and retired to the back rooms of their stores where they alternately dozed, glanced at the Peyton Place Times and listened to the broadcast of a baseball game. This goes on for several pages before Metalious gives us the protagonist, Allison McKenzie. Today’s page, however, doesn’t use omniscience for a wide-angle view of the setting or the circumstances. Instead, the focus is on two riders, who are given names in the second paragraph. Thus, there is no reason for the omniscient beginning. It merely operates to keep us at a distance from the people involved. Further muddying the waters is something that should never be done—simultaneous POV. Whenever you have a collective “they” feeling or thinking or hearing the same thing, we’re in more than one head and our attention is split. It also violates common sense about life. No two people ever feel or think or perceive in exactly the same way. This dilutes the scene and robs it of emotional impact. So my main piece of advice is to re-write the whole thing from either Charlie’s or Keith’s POV. Have all the observations filtered through one of them. This is how readers relate to story. The first thing they want to know about a scene is WHO it belongs to. Now, regarding the setting. I have no idea WHERE we are. There’s dense vegetation, but also an intersection. There’s camouflaged motorcycles and a black Mercedes. You use the terms soldier, rider, and biker interchangeably. Where are we? What are the circumstances? War zone? Drug zone? South America? Africa? Soldiers? Mercs? You can easily use dialogue and interior thoughts to give us essential information. When I advise act first, explain later I’m referring primarily to backstory. That can wait. What we need up front are a few drops of context, which can be woven in with the action. Decker told the Italian immigration official that he had come on business. The official stamped Decker’s passport. He carried his suitcase from Leonardo da Vinci Airport, and although it would have been simple to make arrangements for someone to meet him, he preferred to travel the twenty-six kilometers into Rome by bus. Now a technical question: Can you see landmines? I thought the point of landmines is that they’re hidden and finding them requires some kind of metal detector or radar or robot. If I’m wrong I’m still raising a question many readers will have, so you should clarify it, once again with a bit of dialogue or interior thought. Because this book seems intended for military-thriller fans, every detail of an operation has to be accurate and precise or you will surely hear about it from readers and reviewers. Style note: When using a dialogue attribution, it goes after the first complete sentence or clause. NO: “What are they doing on the road? We have not cleared it yet,” Keith said. Finally, as we’ve noted many times here at TKZ, white space is a reader’s friend. Your paragraphs are too “blocky.” Don’t be afraid to break them up into two or three. So, author, I do want to know who was in that Mercedes, who Charlie and Keith are, and where they are operating. I also want to know whose scene this is. Clarify those things, and I will likely turn the page! The floor is now open for further critique. I had been storing this blog to run around Thanksgiving, but John D. MacDonald forced my hand this week, so I’m posting early. I want to take a moment to acknowledge the books and thank the authors who have helped me along the way. Recently, I was asked by a writer friend Don Bruns to contribute to an ongoing series that has been running in the Sarasota Herald-Tribune called “John D and Me.” Cool beans, I thought, since other contributors included Stephen King, Lee Child, Dennis Lehane, Heather Graham, JA Jance, David Morrell…the list went on and on. Click here to read my article. Don’t worry…it’s short. 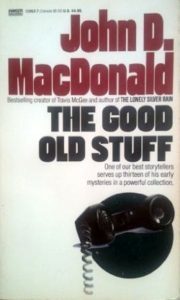 I chose to write about MacDonald’s short stories because, truth be told, I hadn’t read many of the guy’s novels back then. But I had found a yellowed dog-earred copy of his short story collection The Good Old Stuff in a used book store, and at that time, I was struggling mightily to write my first short story. Actually, it wasn’t my first. My first short story was way back in eighth grade. I was an inattentive student, but I had a lovely teacher Miss Gentry, who made us write a short story. The only touchstones in my little life at that point were The Beatles and my only dream was to run away to London. So I wrote about a lonely cockney boy who painted magic pictures. It was called “The Transformation of Robbie.” I got an A on it. After class, Miss Gentry pulled me aside and said, “you should be a writer.” Twenty-five years later, I dedicated a book to her. 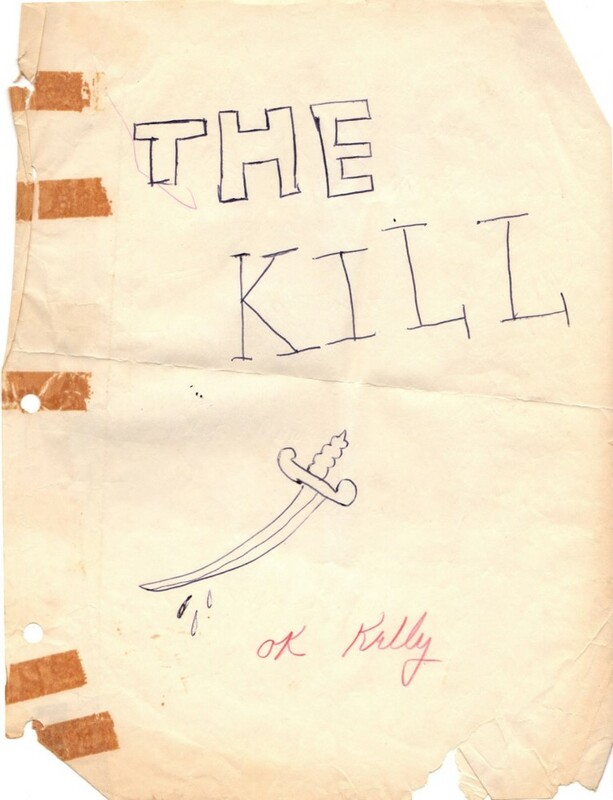 It should be noted that my sister and future co-author Kelly was also churning out short stories in those days. 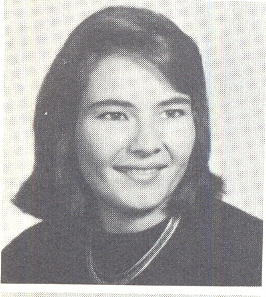 Her most notable effort was called “The Kill.” It was about a serial killer who knocks off The Beatles, one by one. We joke now that nothing much has changed: She still likes to write the gory scenes, I like doing the psychological stuff. 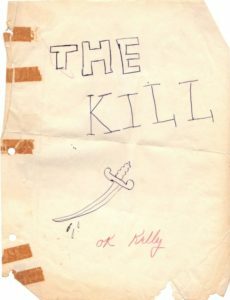 I don’t have my early efforts, but she kept hers – see photo below right for the stunning cover she designed at age 11. Fast forward to 2005. I am trying to write a story for the Mystery Writers of America’s anthology, edited by Harlan Coben. In addition to the big-name writers the editor invites, the anthology holds out 10 spots for blind submissions from any MWA member. I had a good idea for my story and four published mysteries under my belt. But I couldn’t get a bead on the short story’s special formula. What came so easy at age 14 wasn’t coming so easy at age 54. So I cracked open The Good Old Stuff. Maybe it was because I had been reading Cheever and Chandler and was getting intimidated. But MacDonald made it look effortless. His stories, culled from his pulp magazine career, had an ease and breeze as fresh as the ocean winds. I realized I had been fighting an undertow of expectations, so I flipped over on my back and floated. The words flowed, the story formed. My first adult short story, “One Shot” got picked for MWA’s anthology Death Do Us Part. It was the second proudest moment of my writing life, right after Miss Gentry’s A.
E.B. White. Charlotte’s Web remains my favorite book of all time. 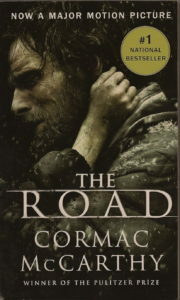 I love it as pure story, but it taught me a very valuable lesson that all novelists should take to heart: Sometimes, you just have to kill off a sympathetic character. “Little Red” Garlock, sixteen years old, skull smashed soft as a rotted pumpkin and body dumped into the Cassadaga River near the foot of Pitt Street, must not have sunk as he’d been intended to sink, or floated as far. As the morning mist begins to lift form the river a solitary fisherman sights him, or the body he has become, trapped and bobbing frantically in pilings about thirty feet offshore. It’s the buglelike cries of the gulls that alert the fisherman – gulls with wide gunmetal-gray wings, dazzling snowy heads and tails feathers, dangling pink legs like something incompletely hatched. The kind you think might be a beautiful bird until you get up close. 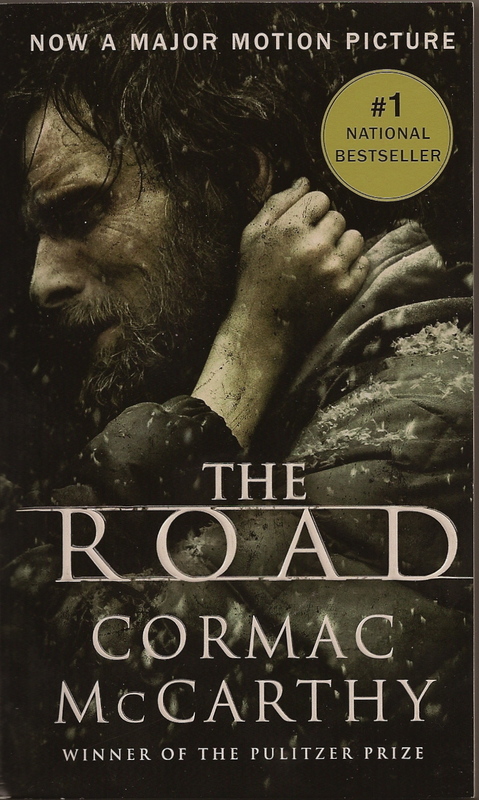 Cormac McCarthy’s The Road. I still think about this story years after I read it. From it, I learned about spare writing and especially the power of one indelible image. Michael Connelly talks about this, too, about how one gesture, word or image can have so much more impact than an avalanche of description. Connelly talks about how he wrote about a cop who seemed the paragon of cool, how nothing about the horrors of his job seemed to bother him. Except for one telling detail – the stems of his glasses were chewed down to the nubs. In The Road, the image I can’t get out of my head, the one thing that stands in my mind as the symbol of post-apocalyptic survival, is canned peaches. He pulled one of the boxes down and clawed it open and held up a can of peaches. They ate a can of peaches. They licked the spoons and tipped the bowls and drank the rich sweet syrup. I can’t eat canned peaches anymore because of this. I want to cry just thinking about. David Morrell. Several years ago, David was the guest of honor at our writers conference SleuthFest here in Florida. This talented teacher, prolific writer, and editor of the anthology Thrillers: 100 Must Reads, and creator of Rambo no less, had tons of great advice. But here is the single line that impacted me as a writer. Find out what you’re most afraid of, and that will be your subject for your life or until your fear changes. David credits this lesson to another writer Phillip Klass (pen name William Tenn) who told David that all the great writers have a distinct subject matter, a particular approach, that sets them apart from everyone else. The mere mention of their names, Faulkner, for example, or Edith Wharton, conjures themes, settings, methods, tones, and attitudes that are unique to them. How did they get to be so distinctive? By responding to who they were and the forces that made them that way. And all writers are haunted by secrets they need to tell. David talks about this in his book The Successful Novelist: A Lifetime of Lessons about Writing and Publishing. Click Here to read the first chapter. She sat on the sand on Miami Beach and watched the sun sink slowly into the ocean in a blaze of orange and pink. When I read that line, I threw the book across the room. But then I picked the book up and put it on my shelf, where it still sits today. (Well, on my bathroom shelf). Because this book taught me that no matter how brilliant your metaphors, how original your story, how beguiling your prose, how deep your unexplored fears, if you have the sun setting in the east, nothing else is gonna work. 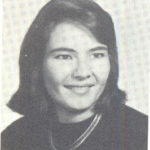 So who were your teachers, what were their books, and what did you learn?